Not my choice of decor, but since that didn't come with the house I didn't need to change that factor. 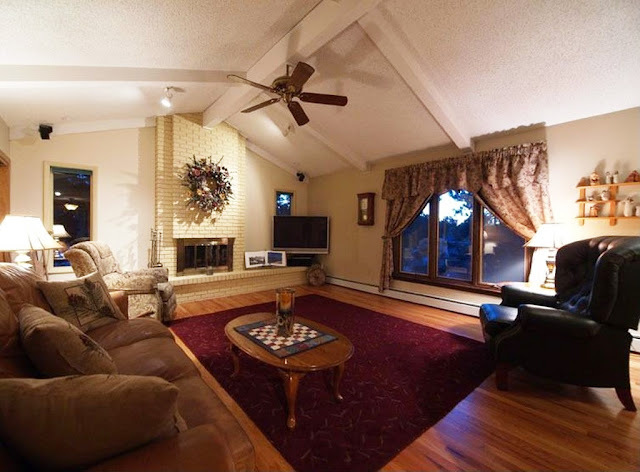 First off, we removed the popcorn ceilings prior to moving in, and the fan had been changed after this picture, but before we purchased the home, (I hate the fan we have now, and am currently mustering up the courage to replacing it. YouTube tells me that changing out a ceiling fan isn't all that hard, but I am scared since we changed out a light in our basement, and after a couple hours of holding up our arms and cursing why the screw wasn't finding the hidden hole, I am afraid of dealing with a heavy fan...to be continued). Anyway, we knew we needed to paint over the hideous yellow brick fireplace, (makes me want to start singing like Dorothy, but her yellow brick road was much prettier). A few things are different in this picture compared to the before picture. One, the window frames had been changed by the sellers who lived in the home before us (the before picture was taken to sell this house to the owners before us...confusing I know, but totally not important). Also, we had already painted the wall around the fireplace with Benjamin Moore's Silver Gray (2131-60). The paint before this was a green that was semi-gloss. We didn't like all the shiny walls, and wanted a different color palette in eggshell finish, (to also help hide wall imperfections since they've been through a lot in 42 years). After painting the wall I was worried we had made the wrong color choice, but since we had purchased 5 gallons of it, I wanted to have hope in it. 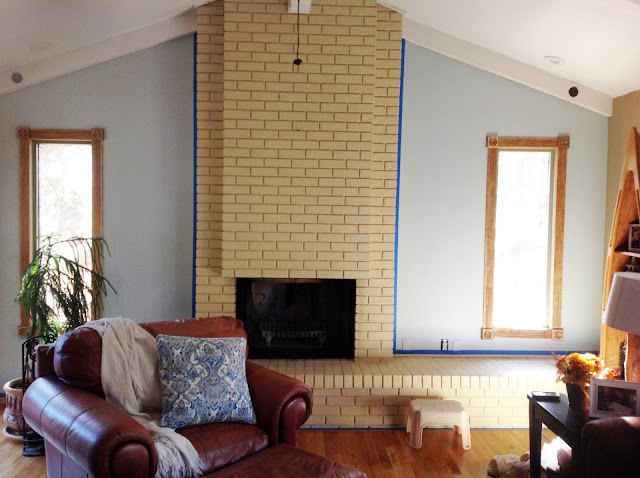 We painted the fireplace in Sherwin William's Extra White (SW4006) semi gloss. I debated about a different sheen, but knew that it would get a lot of dirt from the fireplace and our boys, and semi gloss would be easier to clean. We also painted the window trims the same color. 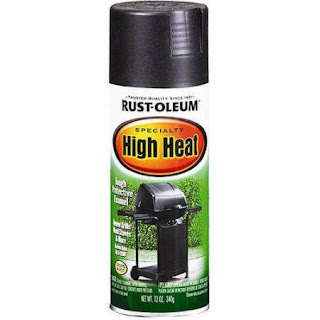 We then spray painted the brass fireplace door with the matte black high heat spray paint that Home Depot sells. That stuff blew my mind. I love it. After painting everything in the blue and white we were a little worried that the room looked "cold". 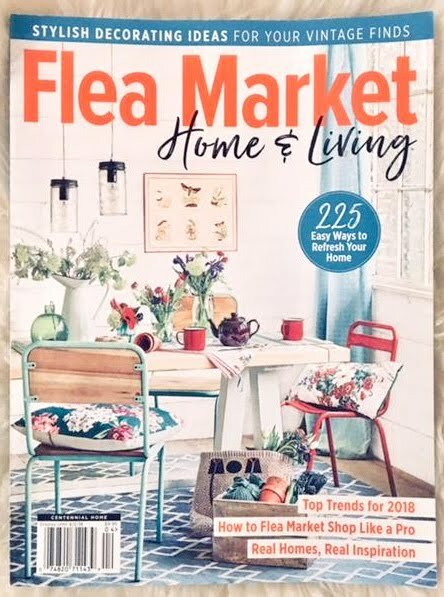 Thankfully the gel stain brought warmth back into the room, and after painting the other walls in the room in Revere Pewter by Benjamin Moore (HC-172), everything came together. The wider the painter's tape, the messier you can be in putting the stain on the beams. We had a few oops when wiping on the stain, but if you use wider tape these oops are less frequent. At first we didn't do this, and the staining process took 3x as long (total estimation, but you get the idea). We then decided to try this step and it was sooooooo worth it. Made things so much faster! We took 100 grit sandpaper and acted as if we were just wiping the beams down. What this did was buff off the paint peaks that were painted over somewhat rough wood beams. No need to sand down any smoother or softer since you are using gel stain and don't need to get down to the bare wood. Gel stain isn't like regular stain in that it doesn't soak into wood. Instead it goes on top of whatever it is wiped onto. Like I mentioned before, it isn't necessarily made to go over paint. 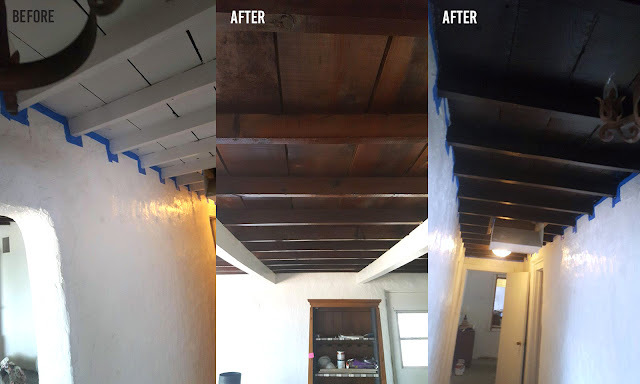 However, we knew we wanted beams to look like wood, and we also knew we were not going to strip the paint off the wood with a stripper or a sander. Gel stain was our only option, and we decided to risk it. We put a plastic baggy over our hand (disposable plastic gloves work even better, but we are cheap), and then an old sock over that. We dipped our fingertips into the gel stain and used about a tablespoon at a time to wipe onto the beam. We then wiped back and forth in the direction of what way the grain would go, as we gradually covered up the paint. As you can see, we didn't use very wide painter's tape. I'd recommend wider like I mentioned earlier, to save yourself an accidental wipe of stain on your ceiling. When I have gel stained furniture I do at least 2 coats, often 3. However, one coat was enough on the beams since we didn't want a uniform color all over since we wanted to emulate a more rustic wood look. Also, when I gel stain furniture I always use General Finishes gel topcoat. Since these beams will get no wear and tear, and we didn't want a shinier finish than the stain already achieved, we skipped the topcoat. And that is it! This process is a fairly fast DIY project that barely uses any gel stain. 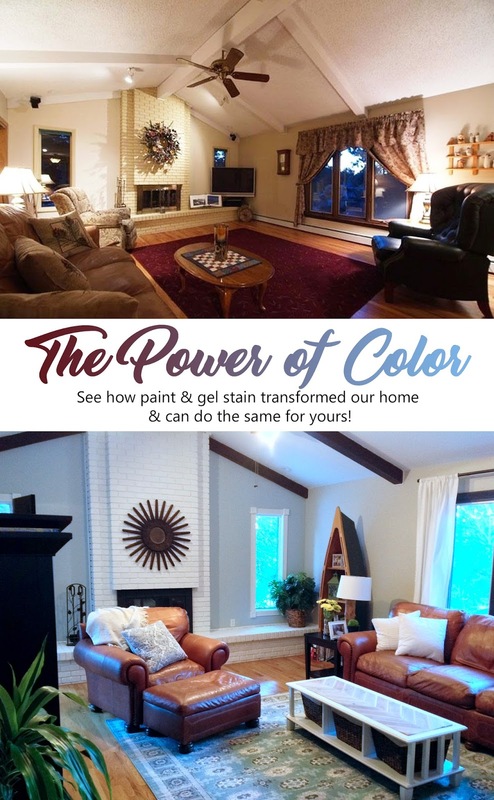 I highly recommend you give it a try if someone has painted your home's wood beams! And not only has this simple transformation worked for me. Many others have contacted me with questions as they prepared for their beam's transformation, and then followed up with news of success. So if you have gel stained your painted wood beams, please email me your before and after pictures too! I can not thank you enough for sharing your advice. I was scared to try and restore the beams in a hallway that my Mom painted years ago. I grew up in this house that was built around 1946...I DID IT!! AND IT LOOKS AMAZING!!! Both parents are gone and we are restoring the house now. I am so thrilled. While I was staining(after a quick 100 sand by hand) my husband would ask a question and I would say "Mimi said to do it like this" lol..anyhow..its beautiful..Thank you so much. Tish, you really did do an amazing job! Congrats and thank you for sharing! Love the transformation!!!!! And really great instructions for using the gel paint! How tall are your ceilings?? Our living room is similar and I want to re-stain our 70's brown beams to a darker color similar to this. Did you have to use scaffolding or just a tall ladder? Kathryn, I believe the ceilings are about 11 ft tall, (I am going off of when we removed the popcorn from the ceilings, which I am pretty sure that was what the measurement was). We just used a tall ladder to stain the beams, (and my hubby did the highest beam since I am 5'6" and he is 6'1" and those extra inches sure came in handy for him). Thanks for asking and good luck in staining your beams too! An unruly child in the home we just purchased had painted the wood beams in her room black with glitter. I tried to strip the paint to at least remove the glitter. After stripping (citra-strip), waiting, then using acetone, it just looks black and brown and glittery. So, I am going to use some gel stain and see what happens, I have some from a dresser refinishing project I just worked on. That really stinks! Was she painting while on a bunkbed? I'm trying to picture her glittering the beams in her room :D. Anyway, so glad this post gave you another idea to fix the situation. Best of luck to you! How much gel stain did you get through on this project. I have about 7x as many beams within a cathedral ceiling painted in an ugly tan color and was just going to paint over them until I saw your page, now I'm thinking just to paint over them with gel seal and that should bring back the wooden look but this product is not available in Australia without shipping it over so need to know what the expense might be...? I used probably a tenth of a gallon of gel stain. General finishes gel stain at Woodcraft is about $70, and I think Amazon sells it too. I am almost 100% positive that you will even have leftover gel stain with the amount of beams you will be doing. Hi, you inspired us to do the same with our dining room! Did you use only 1 gal of GF gel stain for your room? I'm wondering how many cans we'll need. How awesome that this inspired you! We only used about 1/10th of our gallon since gel stain goes a LONG way so you could get away with a much smaller can with most projects. Also, what finish.. eggshell or semigloss did you use? Thanks! Thank you Robin for asking. First off General Finishes Gel stain is not paint, thus there isn't a choice in finishes. When I use it on furniture I sand with 220 grit to give the stain more adhesion, but since no one will be touching your beams this isn't necessary. Also gel stain is VERY different than normal stain. Stain is made to sink into wood, but gel stain does not sink in and thus a little bit goes a long way. Paint guys will most likely not know anything about gel stain, and many woodworkers don't either because gel stain has only been around for a few years (I think). I've used gel stain on a ton of different things and love the ease of it, the beauty of it, and it's versatility. I am almost positive you can just apply the gel stain on your parents beams as is. I do not recommend other brands of gel stain though. GF is high quality and it really works well and looks good and the other brands aren't as good. Hope that answers your questions, but feel free to ask more if needs be. Good luck! Hi Mimi, We have a very similar living room design in the new house we just bought, and were hoping to use gel stain over the painted white exposed beams in the living room. You mentioned that you just used 1 layer of gel stain. Did you wipe off the excess stain? When putting on the gel stain we wiped it on in very small amounts and worked it until we liked the look. It worked somewhat differently to the "wax on wax off" technique when putting on gel stain on furniture. Not sure if that answers your question? Thanks for your compliments and question Brittany! I'd be very surprised if you have high gloss paint on your beams since high gloss paint is rarely used when painting walls let alone ceilings. 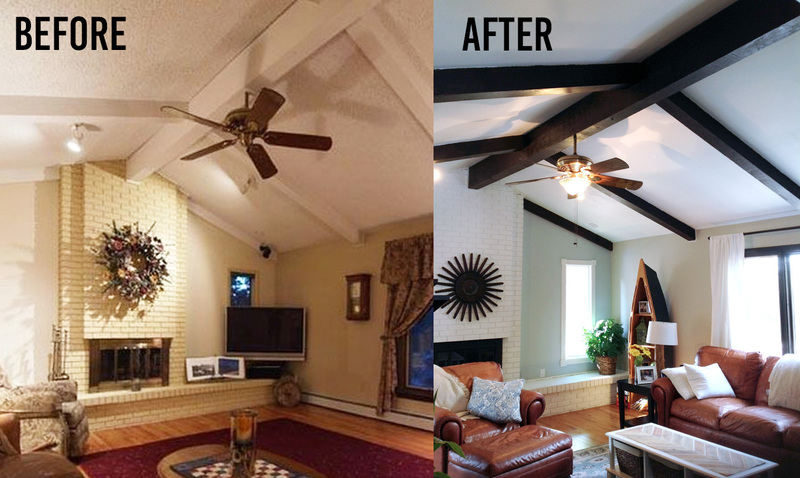 However in answer to your question, we had flat paint on our beams, one of the most common ceiling paint finishes out there since flat hides imperfections and doesn't attract a lot of attention. 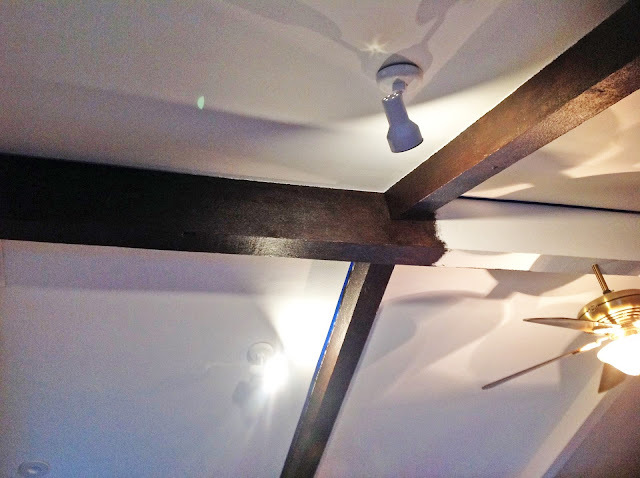 If you do have glossy beams I would just sand the beam a little bit more than this article suggests. I'd use 100-150 grit sandpaper, and not sand off the paint, but really act as is you are cleaning it up with the sandpaper...if that makes sense. 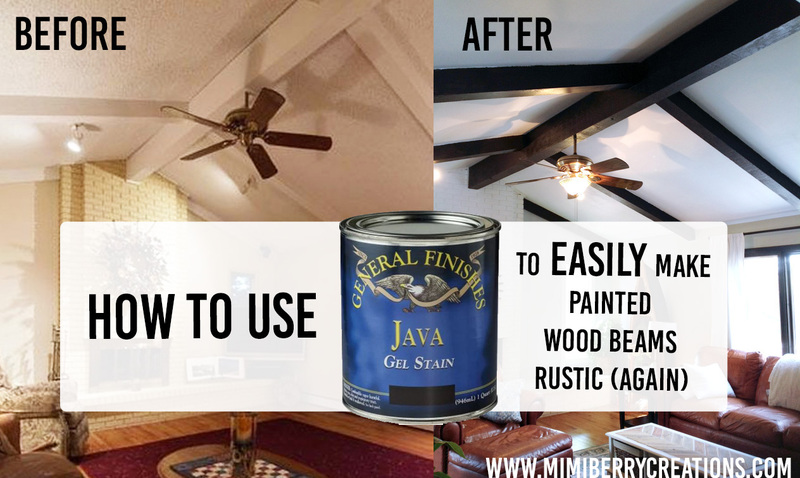 You'll still have almost all of the paint left on your beams prior to using the gel stain, but the sanding prep will give the stain something to hold onto/adhere to. Best of luck! I'm excited for you! Can you explain the difference between, and benefits of, using gel stain instead of just paint? That is a very good question. From my own experience I see the following benefits: 1. Easier and more fun to apply vs paint 2. It looks richer 3. It allows you to see wood grain underneath, and complements wood better 4. It is very similar to a traditional stain look, but doesnt require you to get down to bare wood 5. It is very versatile. Hope that helps answer your question!